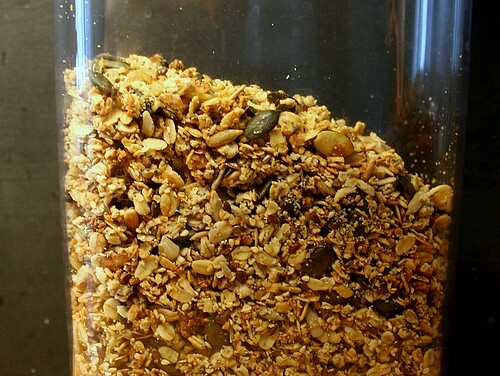 Over the years I’ve tried numerous muesli and granola recipes, and although I think that homemade granola is 100% the way to go, I’ve never found that perfect recipe. In my experience they’re either too sweet (lots of honey, sugar or syrup)…or too healthy (look and taste like sawdust). Recently I’ve decided to trust my instincts; I’ve played around with proportions and ingredients and now I think I’ve come up with the perfect mix – slightly sweet, crunchy and made with loads of seeds. I’m not mad keen on dried fruits and nuts in my muesli; I prefer to top it with seasonal fruit, yoghurt and a touch of honey, – or perhaps a fruit compote and greek yoghurt, – or (in winter) spiced and soaked dried fruit — (it sounds as if more posts may be needed to tell you some of my favourite toppings…).